We arrived to find that cattle had leant against one of the fence posts (that forming the hinge side of the gate) but it had resisted and just needed hammering back into position. We laid out a trench 10 × 5 metres towards the north-eastern corner of the compound, leaving a 1.5 – 2 m walkway around the edge. We started work removing the turf around 9.30, working from the north-eastern end. The soil forming the base for the turf is a mid brown silt loam with very few (<1%) inclusions. At the depth reached at the base of the turf roots (about 0.1 m), there is no trace of the former building on the site and the topsoil appears to be an even colour throughout. Ken Bird called in to check on progress. Despite searching all round the church for a benchmark, there are no traces of one. I will check the large-scale Ordnance Survey maps to found out where the nearest one is located. Failing that, I will check the 1985 survey records to see that the temporary bench mark was then and where it was (I have a vague recollection that it was on one corner of the cattle trough, which would be very convenient for us!). After removing the turf, we had a quick shovel scrape. Nothing definite is showing up, although there are some vague colour differences. What is most surprising is that there is no trace of masonry from the demolished barn. We left site around 1.00 pm. On checking at Letchworth Museum, the benchmark was on the south-western buttress of the tower of St Nicholas’s church. This has been repaired in recent years, as the clunch blocks were becoming badly eroded. I emailed the Risk Assessment to Fiona Timms. 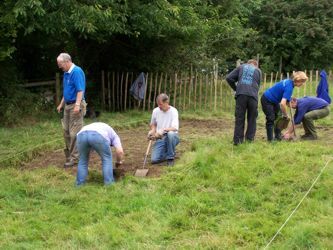 Posted on 30 July 2007, in Fieldwork, Norton Church Field Dig 2007. Bookmark the permalink. Leave a comment.